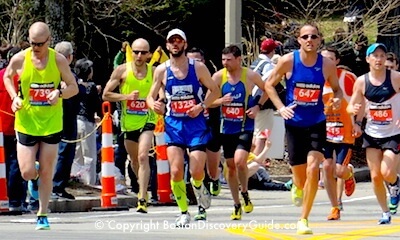 I will be getting off the Commuter Rail at Back Bay station on Boston Marathon Day - Monday, April 16 around 1 pm. Will I be able to take a cab from there to my home on Beacon Street in Brookline? If not, will I be able to access by foot the closest subway, Hynes Convention Center? 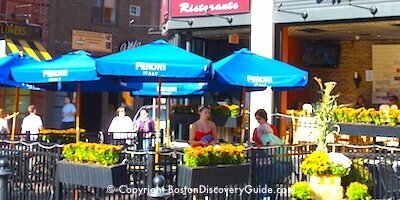 I am asking because I read that we won't be able to cross Boylston Street due to the Marathon runners. You're right about parts of Boylston being closed - and yes, you're going to face some logistic challenges to get to Beacon Street in Brookline. In addition to the Copley Square T station being closed due to being across from the Marathon finish line, Boylston St will be closed between Mass Ave (adjacent to the Hynes Convention Center station) and Arlington (by the Public Garden). Also, Mass Ave will be closed between Beacon Street and Belvedere. Of course, not all of these street sections are part of the Marathon route, so people may be able to cross them even if they're closed to traffic. To make matters worse for you, though, Dartmouth St (which runs by Back Bay Station) will also be closed between Newbury St. and St. James, so there's no way that a cab can pick you up at the station. Also, large parts of Beacon Street are closed - I believe through most of Brookline. So assuming this includes the area where you live, the cab isn't going to be able to drop you at your doorstep either. If you really, really want to take a cab, call the cab company that you'd probably use the night before and get their advice about where they can pick you up. Maybe somewhere along Huntington Ave or Columbus Ave? That would keep you on the right side of Boylston Street. Even in those areas, there will probably be spillover crowds, so if you opt for a cab, have extra money because the trip may be slower than usual and the fare bigger. If you decide to take the T, personally I would walk back to the Arlington stop and get on there. It's about the same distance, maybe less, than the Hynes stop and you may be able to get there from Back Bay station with less detouring. When you leave the station, depending on how the crowds look, you could either turn right and cut back on St James, or go left and head over on Columbus Ave. Once you get up to Arlington St, you could scope out options for getting across Boylston at this point - worst case, you might have to continue up Boylston to the Boylston stop, but it's less than 2 blocks. I *think* you can also enter the Arlington Station without crossing Boylston, but can't remember 100% if the exits on the south side of Boylston are also entrances - or just exits. If you do decide to walk over to Hynes, probably the best bet in terms of avoiding closures is to use Huntington Ave and then take a right on Belvedere to cut over to Mass Ave, hoping that the area near the Hynes station is open to pedestrians. You should also probably make sure your Charlie Card has plenty of value, or add fare to it before you leave so that you don't have to stand in long lines if the stations are crowded - which they probably will be. Of course, by 1pm, some of the crowds will already be thinning out, hopefully, and if the weather is cold or windy or pouring rain (or all 3), only the avid fans (or friends and family of the runners) will still be on the streets - everyone else will be packing the bars and restaurants. So it may not be too bad. But if the weather is gorgeous and sunny, this part of Boston will still probably be like one huge street party by the time you arrive. On the other hand, I'm possibly being too negative due to my own going to the St. Patrick's Day Parade in South Boston a few years ago on a totally gorgeous day with clear sunny skies, 70 degrees, and mammoth crowds. Getting there on the Green Line, I honestly thought I might be crushed to death at a few points - same thing being part of the crowd watching the parade. And then, because the inbound Broadway station was closed, we had to walk a mile back to South Station. But you know what? The parade was terrific, the walk back to SS was good exercise, and we stopped in Chinatown for dim sum - all in all, lots of fun! 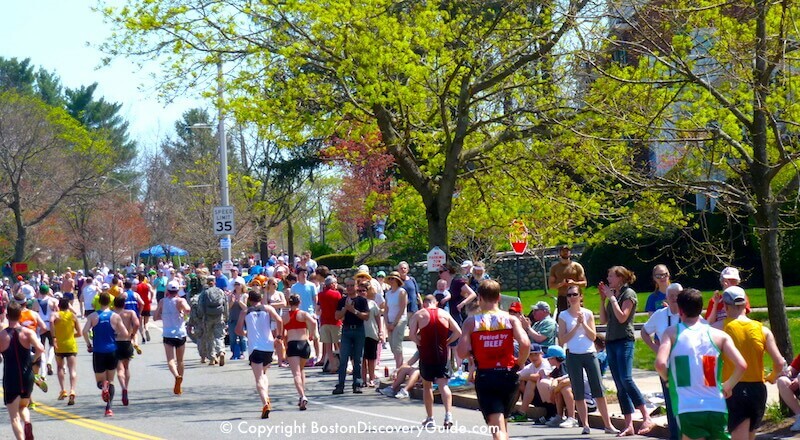 Hopefully you won't be too inconvenienced by the Marathon as you return home, and enjoy the adventure of getting back. Pack light, take a camera, and get some great photos!